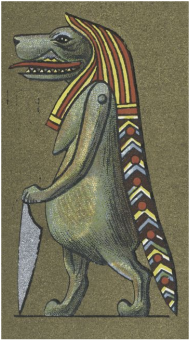 Bipedal Hippopotamus, exposed human breasts with feline hands and feet and a crocodile tale and back often resting or carrying a sA symbol that means protection. Goddess of fertility, women, childbirth, child rearing, and the home. She was a fearsome protector and fertility goddess. Charmes of the goddess were often worne by pregnant women. Considered her a demon in later times.